WARNING: This is about as exciting as it gets. Sorry. Today I had planned to go to IKEA and buy a new bed frame. I had looked on-line at options and checked the potential for the item being at the Seattle store. There were either 1-2 or 6-10 in stock – depending on whether we got White stained oak or birch veneer. We already have some IKEA furniture, but I was not sure of the veneer. First omen: After driving about 7 miles I realized I did not have my wallet. Double back and then on the road again. On to the hall of big boxes. This particular unit has three boxes, plus needs a brace and slats. Good omen: There was one more Box 1 for the Birch Queen bed frame. There were several each of Box 2 and Box 3. The Box 3 I had to move off of the remaining Box 1 had a ripped corner, so I decided to choose a different box. I managed to muscle everything onto a cart. Box 1 was wider than the cart base, so I had to put it on edge. Bad counting: I got to the checkout, and then discovered I had two Box 2s, and no Box 3. Instead of sending me back to go, they had a runner find and bring the Box 3 to exchange with my extra 2. (Nice.) The nice runner loaded Box 3 onto the cart. It was loooong, and stuck back into the area where you would naturally stand to push the cart, but I was happy for the bit of help and just left it there. Packing the Car: The longest package was 81″ long. The car has about 84″. A little maneuvering and leveraging and balancing, and the car was finally packed with our new bed frame. Drive home: I attempted to re-enter the freeway by retracing my steps from the store. Unfortunately this was one of those areas where it just doesn’t work that way. So I just started heading in the direction I thought I should be going. Luckily there was not much traffic because I did not get back on the highway until I was at the third highway on my trip. Unpacking the Car: Yeah for helpers. Carl was home and we were able to carry all pieces in easily. Building the furniture: WAIT, not yet. No room for two beds in the room at once, so I will wait until the new mattress is a day away. Instead I went downstairs to rebuild a piece of furniture we can no longer use (with a BIRCH veneer). BONUS: IKEA had some drawer slides that I can use to replace two that were bent several years ago. I will no longer have a drawer that sticks. Yeah. This entry was posted on December 1, 2013 at 11:32 pm and is filed under Uncategorized. You can follow any responses to this entry through the RSS 2.0 feed. You can skip to the end and leave a response. Pinging is currently not allowed. IKEA is going to open a store in St. Louis! I am recalling a trip to IKEA several years ago to buy a coffee table. The box was big and somewhat unweildy and I was alone. it was also approximately 95 degrees (no lie). Box on the cart and out to the car. 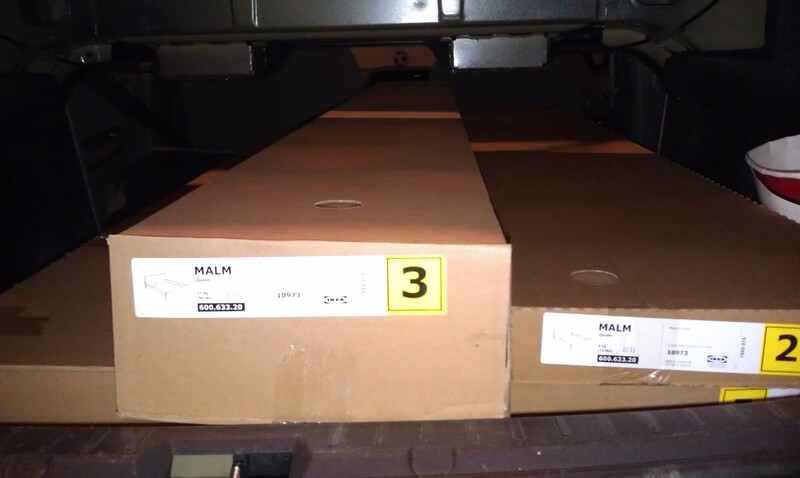 I open the trunk and am trying to get the box off the cart and into the trunk, but it is unweildy and kinda heavy and the cart doesn’t have brakes, so it keeps moving. There is a car with a mom and teenage son waiting for my parking space. YOU KNOW WHAT WOULD SPEED UP THE PROCESS?!? IF ONE OF YOU GOT OUT OF THE CAR TO HOLD THE CART FOR ME. But no. They were in an air conditioned car and it was about 95 degrees out. I kinda took my time backing out. it’s the little things…. and I can only hope karma came back around to them eventually. A trip to IKEA in Brooklyn and then putting together furniture in a marathon in Manhattan, as well as doing nearly the same thing 2 years later in Santa Monica have given me a horror of anything from that store. The BIG BOXES. The thousands of parts. Ack. 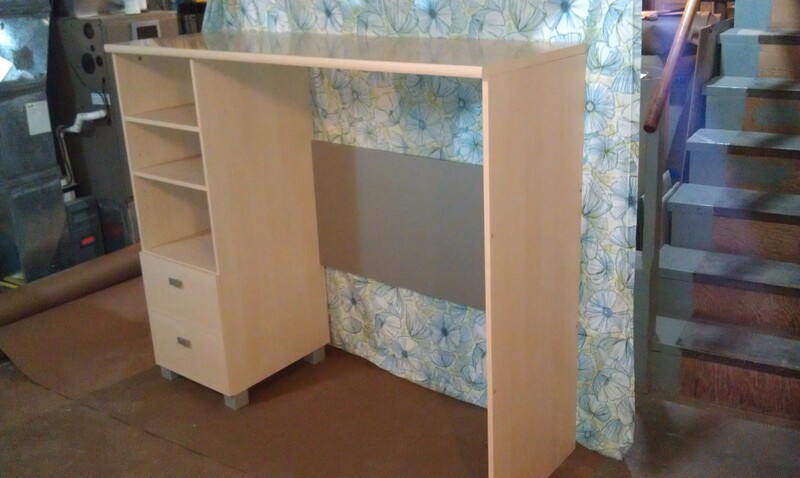 Is the piece you’re selling the right height for a standing desk? They’re supposed to be better for you than sitting all day. I’m assuming it’s a headboard+ for a twin bed.